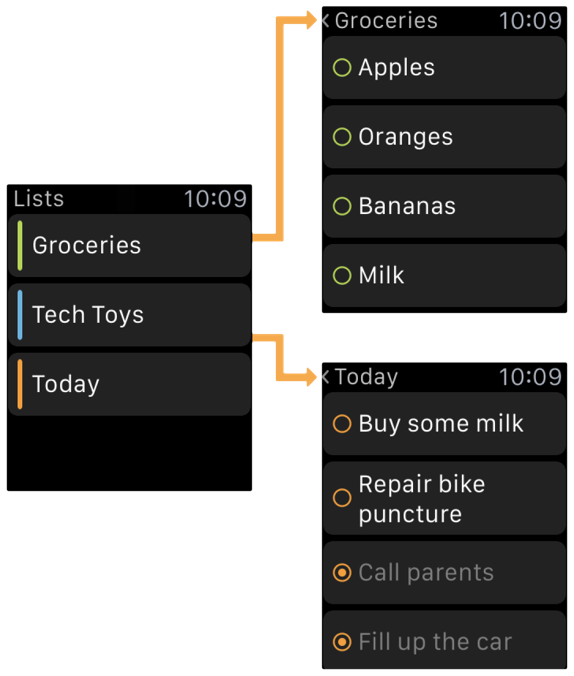 So now we’ve covered what the apple watch is and had a brief introduction to what you can actually do with it, we can have a bit more of an in depth, technical look into what you can do with app instances, glances, and notifications in this third blog of our Apple Watch series. Note: this is a technical post suited for developers etc., if you’re just interested in what you can do with the apple watch as a consumer, read our blog here. Examples of a hierarchical and page based app – from previous screens on Apple. 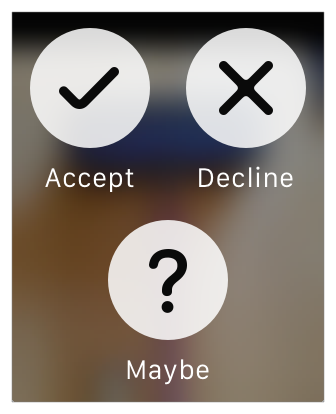 To somewhat get around the inflexibility of a page based application, Apple have also introduced modal dialogs, which will be displayed over original application. Modals can either be a single view, displaying a piece of information such as a map, or can be page based where the user can swipe between several photographs for example. A really neat addition, which doesn’t currently exist in iOS, is the ability to display context menus. These are up to 4 items a user can do when they long press on a screen. For example a music player might allow a user to shuffle or repeat the album. Be aware though, context menus are specific only to a screen, it won’t be possible to display custom context menus for each individual thing on a list. Next, we discussed in the previous blog how glances will help Watch users to quickly get tiny bits of information, such as the local weather, from your app. However, glances have quite a few restrictions. Firstly, glances cannot be scrolled at all, whatever content you want to display must fit on the screen. Secondly, your glance must match a guidelines of having a top element (such as the weather icon) followed by the actual content. Finally, if a user taps anyone on your glance it will open your Apple Watch app, hopefully to a place in the watch app instance that makes sense. 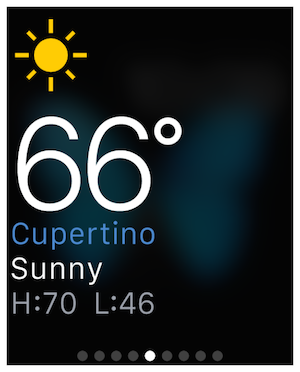 Finally looking into notifications in more depth; “short look” notifications have to be preconfigured to displaying the Apple Watch icon and name, and a title string for the notification which can be updated depending on the title screen in the notification payload. However, as demonstrated above, there isn’t a whole lot of space to write your title. If the user keeps their wrist raised so as to display the notification as a “long look” notification we can display a lot more information to the user which they can scroll through. We can also provide up to four custom actions, and a dismiss button that will always be present so that the user can quickly deal with their notifications. These custom actions can enable users to quickly deal with the notification without entering the full watch app and resume whatever they were doing before the notification quicker. Now we’ve covered in some depth what things you need to keep in mind whilst creating your Apple Watch ideas. Next we’ll look at the current limitations with the WatchKit API, and explain why you can’t do some of the things on the Apple Watch that you could do on an iPhone.